Leonardo’s earlier designs for flying machines were ornithopters, that is they had flexible wings based on the structure of birds’ wings. 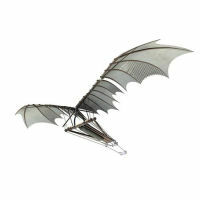 This version of an ornithopter seeks to harness the physical power of the human body in the most efficient way possible. The pilot, who is in a horizontal position, activates the wings by pushing on the pedals with his feet. A series of cables running from the pedals to the wings instigate a complex series of movements. In addition to completing a rotatory movement, when the wings bend they make a flexing movement towards the centre. The result is a compound motion that imitates the movements of birds wings in flight closely. Leonardo does not seem to have been aware that the feathers of birds’ wings twist on the downstroke, propelling it forward. Neither did he acknowledge that man did not have sufficient muscle power to emulate birds. Aware of the dangers of testing the machines he advised that it be tested over a lake, and a “long wineskin should be carried as a girdle, so that in the event that you fall you will not be drowned”. Bolt the upper hall and make a large and tall model; and you will have room on the upper roof…and if you stand on the roof, to one side of the tower, people in the ‘tiburio’ will not see you.